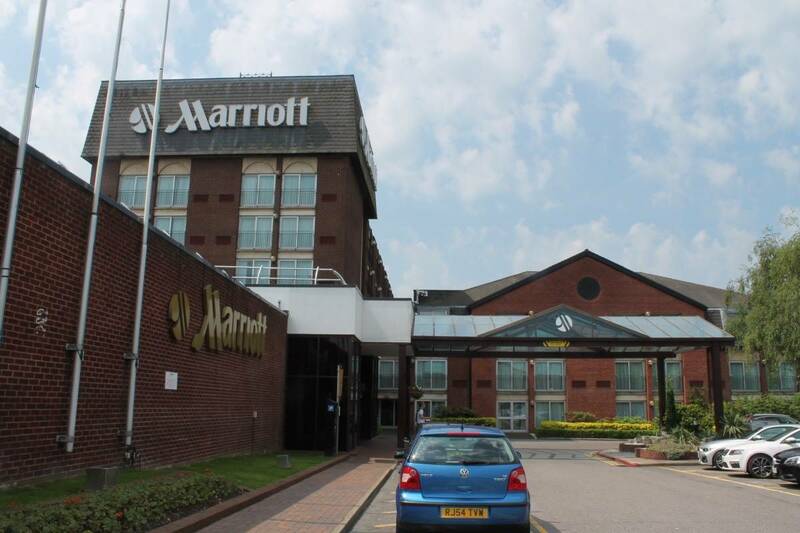 Last weekend Hubby and I were invited to celebrate our wedding anniversary at the Marriott hotel near Heathrow/Windsor. We hadn’t had a night away by ourselves, without the children, in such a long time and we were really looking forward to it. 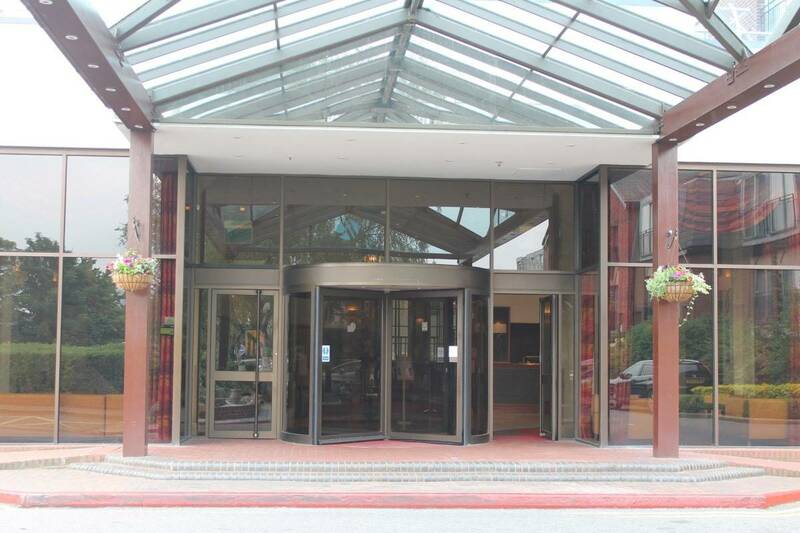 The Heathrow/Windsor Marriott is ideally situated for the airport so perfect for holidaymakers before or after their vacations but it would also suit anyone on business or anyone looking for a break away. 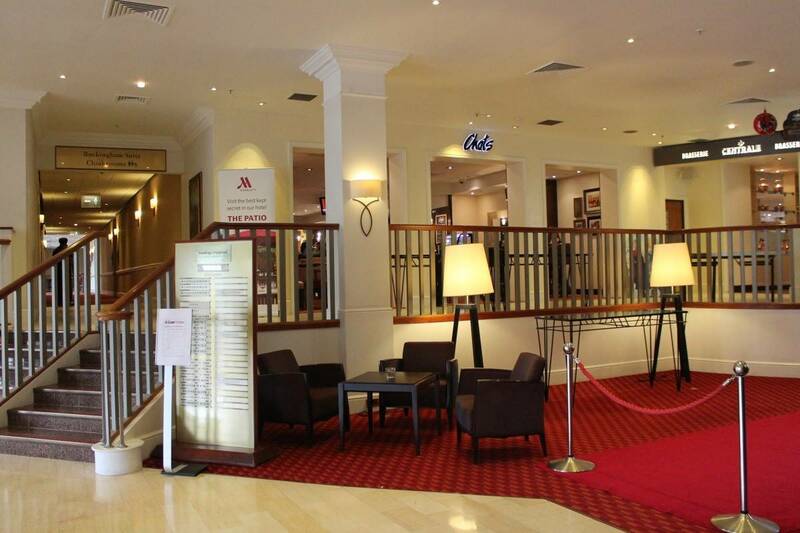 Due to the hotel’s location there is a £12 car parking charge which is added to your bill when you check in. 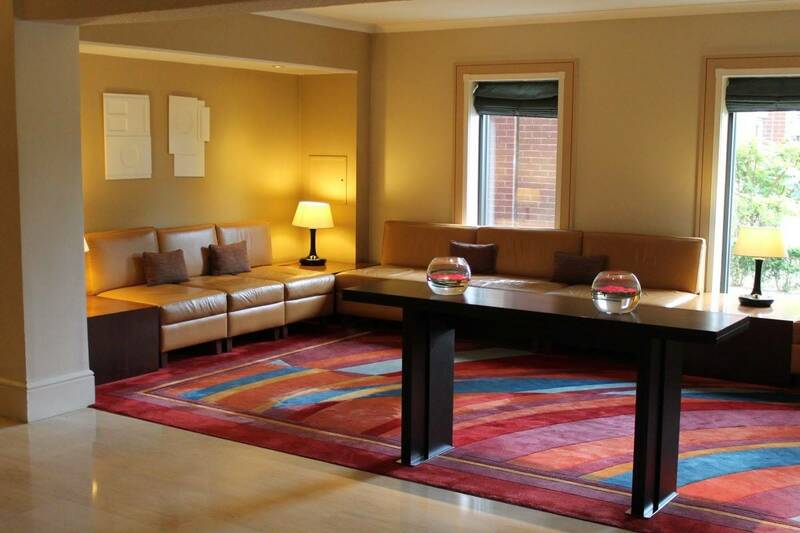 The first impressions as you walk in the hotel are fantastic with a really opulent feel and a lot of staff waiting to check you in. 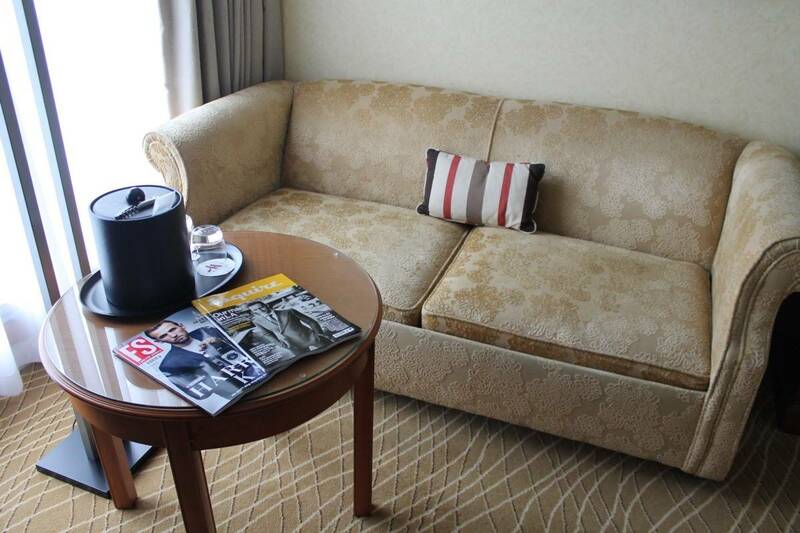 We were in a standard double room which had a lovely seating area as well as the bed, a dressing table and desk. 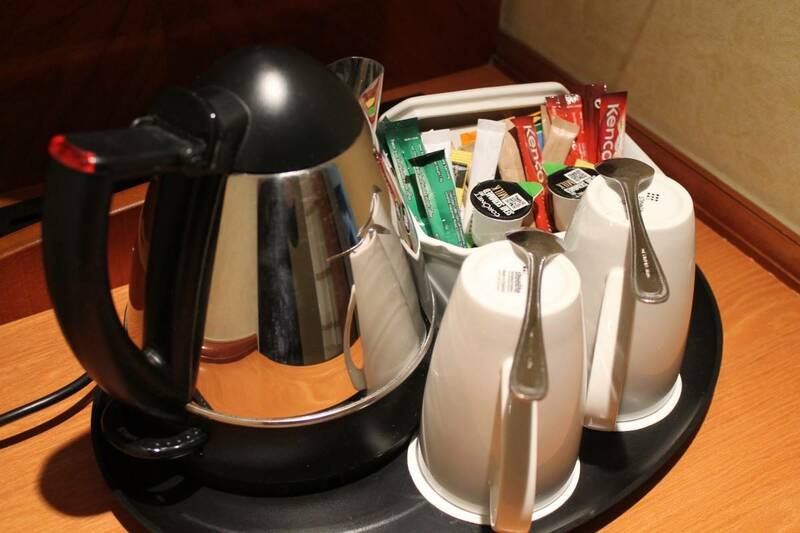 It also had everything we could need for our stay – fridge, iron, trouser press and a fully stocked tea and coffee station. 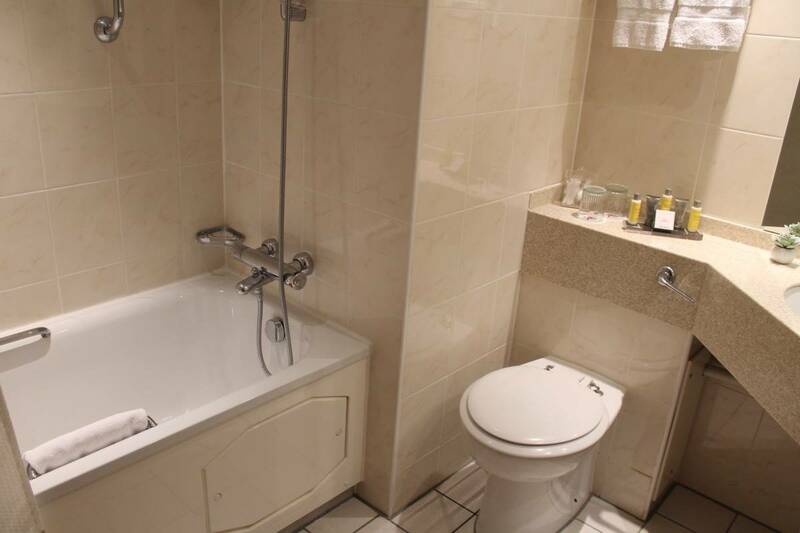 The bathroom was a good size and came with plenty of fluffy towels and complimentary toiletries. The shower had good power to it which is always important and we couldn’t have needed anything else from our room – it was perfect for our stay. We had dinner in the hotel’s Brasserie Centrale restaurant which had a relaxed atmosphere but lovely menu. There was the standard al la carte menu or a specials menu to choose from. Hubby and I went for the three course specials menu and really enjoyed our meal. 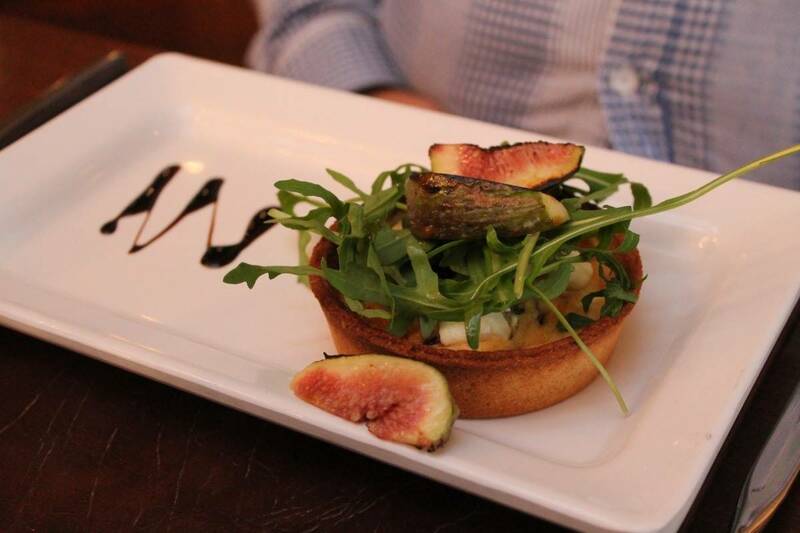 For starters we Hubby had the fig and caramelised onion tart which he really enjoyed although was expecting it to be hot. Once he realised it was meant to be a cold dish he really enjoyed it and said the flavours worked well together. 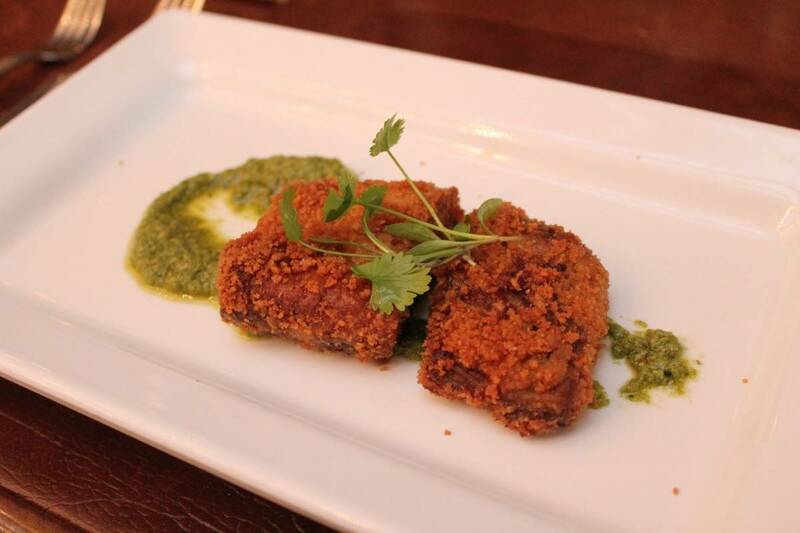 I went for the fried lamb which was served with pesto. 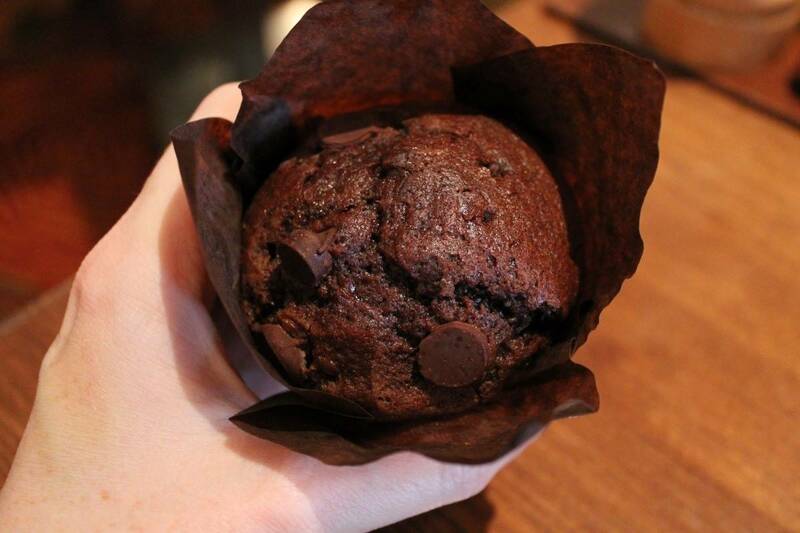 It was really nice and not something I had ever had before. 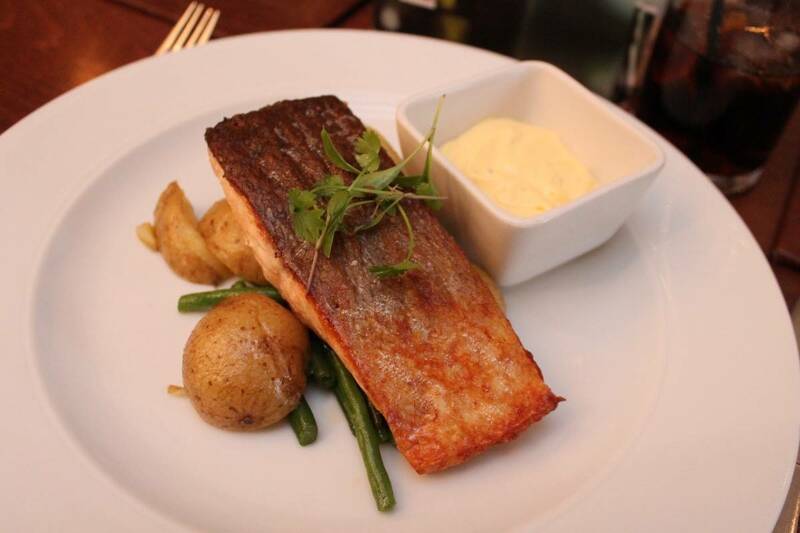 For our mains I chose the pan fried salmon which was beautifully cooked and served with new potatoes and green beans. It was a really lovely dish and just the right portion size. Hubby went for a burger which came with so much inside it – the usually cheese and salad but also a fried egg and pineapple! 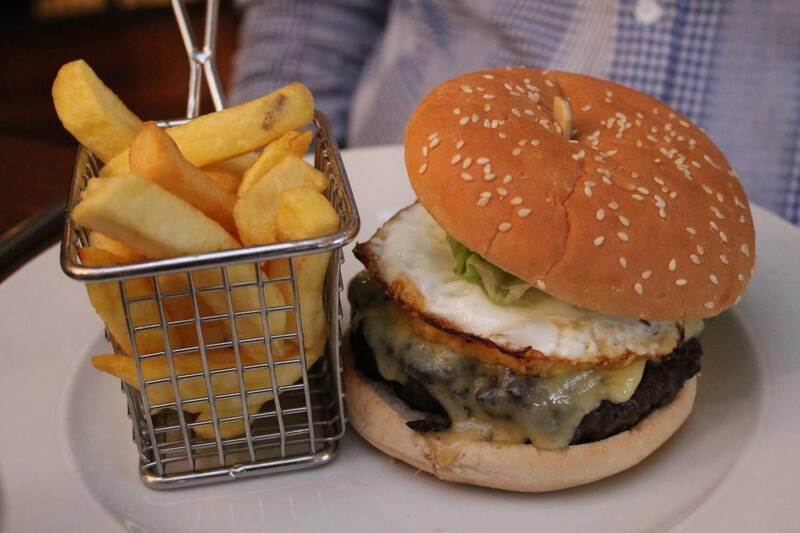 It was served with a good size portion of chips and Hubby really enjoyed it – you can’t go wrong with a really good burger. For our desserts I chose the flourless chocolate cake which had a consistency like rich fudge and was so lovely. Hubby had the orange posset which he enjoyed and found refreshing but said it didn’t really taste like orange. Both had been decorated with Happy Anniversary messages for us which was a really lovely gesture. We really enjoyed our meal and had hot drinks to finish it off before heading back to our room. 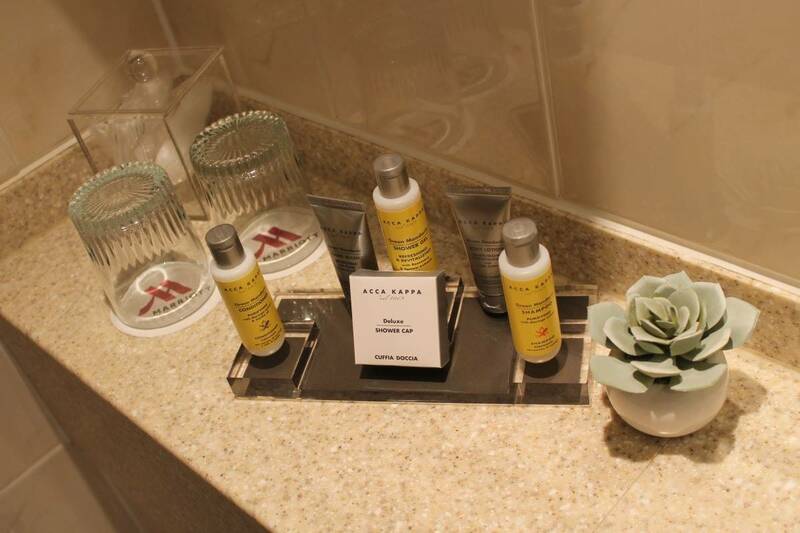 If we’d had more time we would have loved to try our the facilities at Marriott Windsor/Heathrow – they have a swimming pool, sauna, steam room and gym that we could see from reception and looked fantastic. 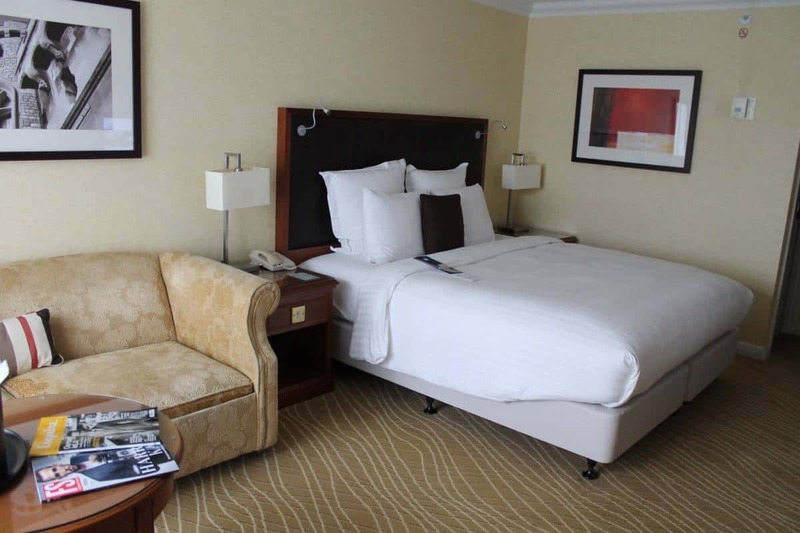 The bed in our room was really comfortable and the pillows and duvet were just right – perfect for a good night’s sleep. The only thing that I am always complaining about in hotel rooms is the fact there were no plug sockets near the bed but that really is my only criticism. 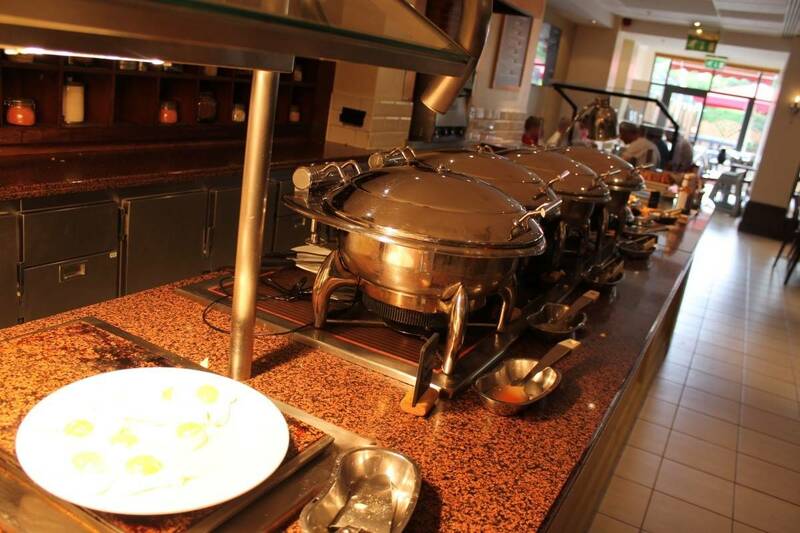 Breakfast is served until 11am and had so much to offer in a buffet setting. There were many cooked options, a whole range of cereals, different breads and pastries and one of the best continental selections I have seen in any hotel with not just cheese and ham but a lot of fish options too. There was also plenty of fruit and juices as well as hot drinks. 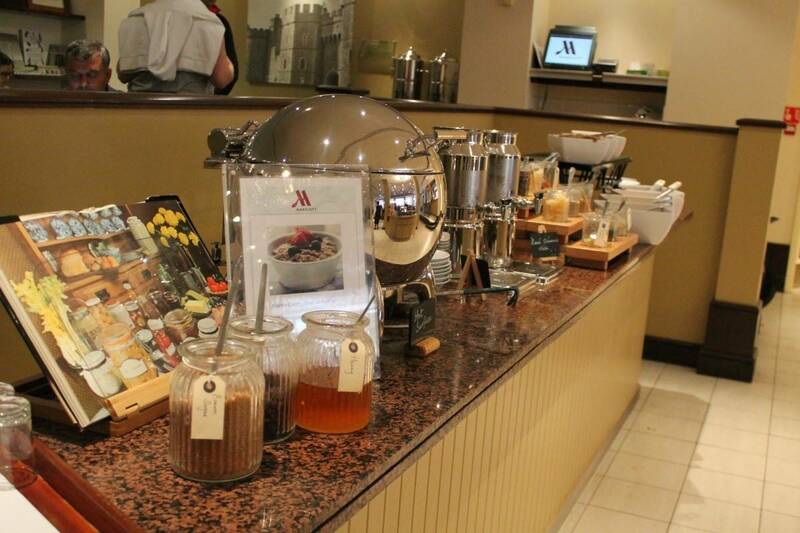 It was one of the best breakfast selections we have experienced. Check out wasn’t until midday giving us plenty of time to relax and enjoy our weekend together. 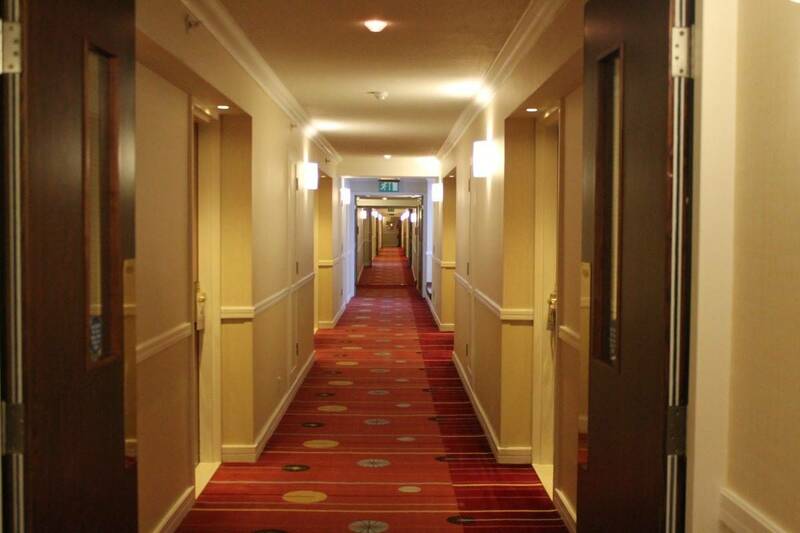 The Marriott Heathrow/Windsor was the perfect place to relax but would also be great for anyone looking to explore the local area – Windsor Castle and Legoland are both really close by. We really enjoyed our stay and wouldn’t hesitate to go back. This sounds excellent. 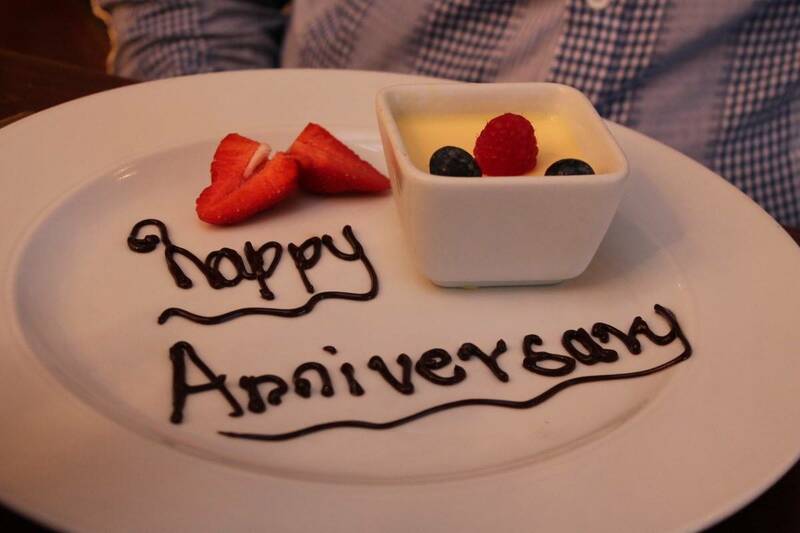 I love the little touch of writing happy anniversary on your puddings! 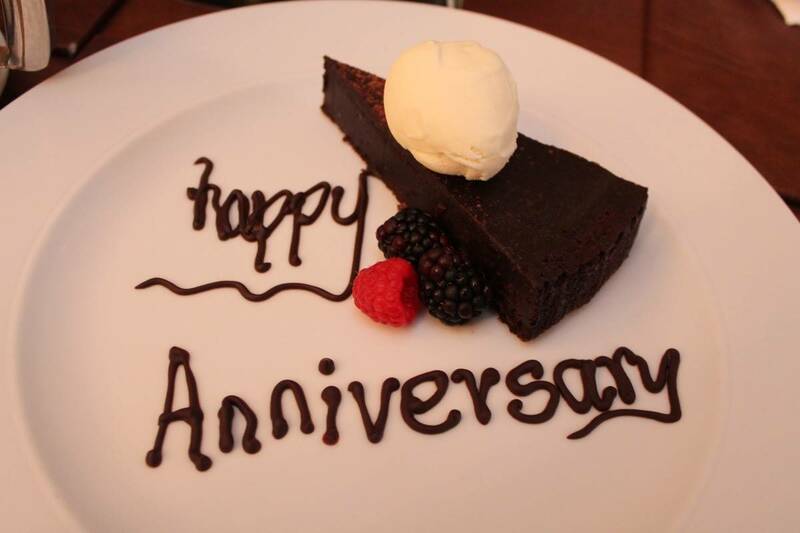 This looks lovely and what a nice touch to put the message on your dessert plates! I want to try and arrange a night away with Si at some point this year, just the two of us for a change. Down here in Cornwall really though, just in case anything happened at home, but its just so nice to get time just the 2 of you sometimes isn’t it? Happy anniversary! It looks like you had a wonderful break to celebrate. The food looks delicious! 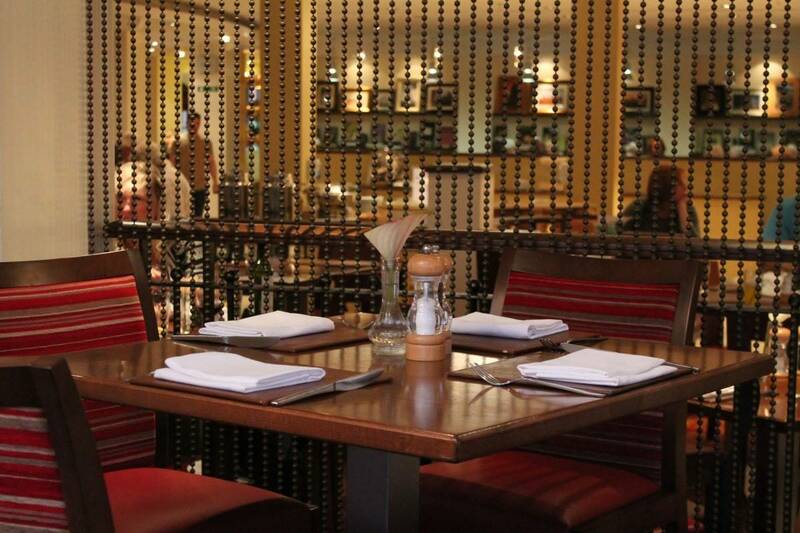 This place looks fab, and the food looks amazing. How lovely that they put messages on there for you. I am so glad to hear that you both had a lovely time.